Peach Blossoms, aren't they pretty? You don't eat this part. 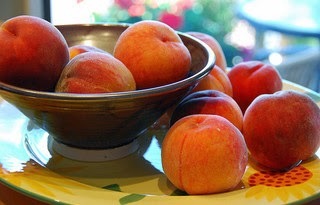 There are two main categories of peach cultivar: freestone and clingstone because with some varieties the flesh sticks to the pit, and with others it doesn't. My favorite peach recipe is my own Easy Peach Cobbler, which is really a dump cake. I found a link on the internet for my exact recipe, which I've posted below with other recipe links. Basically, all you do is take a large can of peaches in heavy syrup, pour them into a 9 x 13 pan, dump a box of yellow cake mix on top, dot with butter, and bake. So easy and so YUM. The Peach has it's own Wikipedia Page; Here are some books about peaches on Amazon. Source Articles: Wikipedia: Peach; Holiday Insights: August; Brainy Quote: Peach Quotes; Gone-ta-pott National Peach Month.